There was just so much to pack into one posts, that I had to break it into two. So how about a little chocolate and strawberry? I used a Betty Crocker gluten free cupcake mix, substituting the water for almond milk. Items to have on hand include: one Betty Crocker chocolate cake mix, cupcake liners, 1 carton of strawberries, almond milk, 3 eggs, 1/2 cup butter, red gel icing, my buttercream recipe ingredients and two piping bags. You will also need a Wilton 1M tip. Bake the cupcakes as directed on the box and cool completely. Make sure your eggs are at room temperature before use. If you have forgotten to get them out of the refrigerator in advance, submerge eggs in warm water until the eggs become warm. Make up a batch my buttercream recipe and split between two containers. 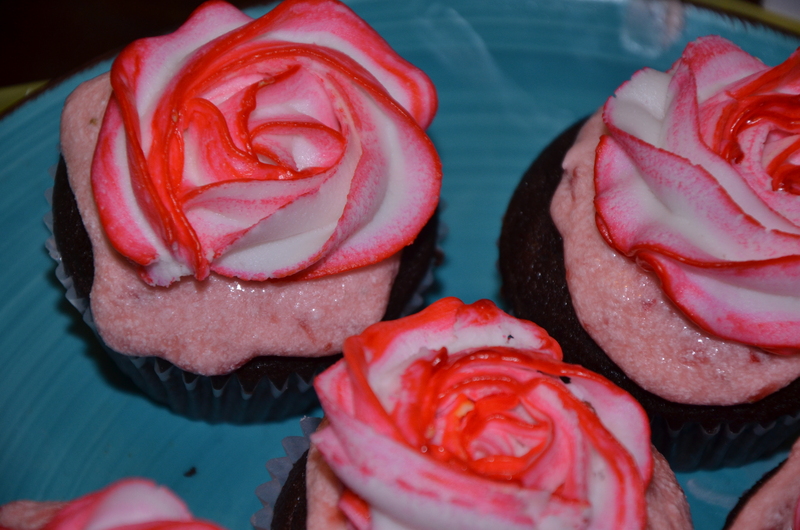 One batch will become the filling and one will become the rose. Wash and remove the stems from the strawberries. 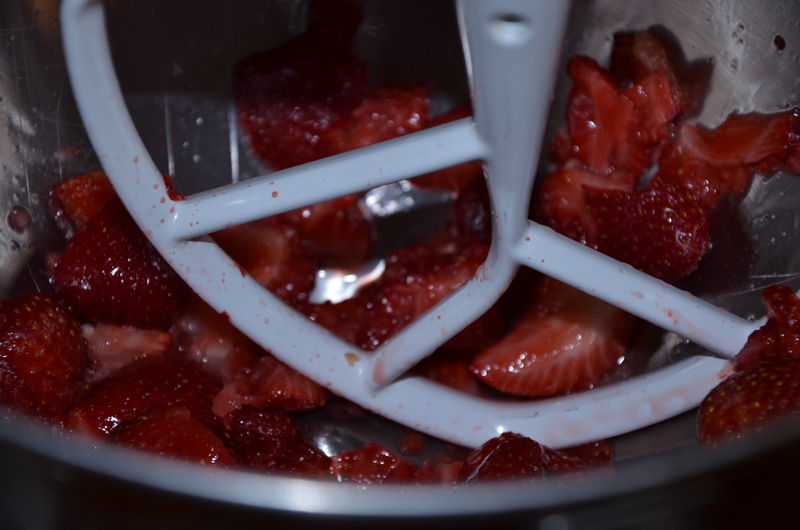 Add the strawberries to your mixer and use the paddle attachment to mash the strawberries. If you do not have a stand mixer, rough chop and mash the strawberries in a small bowl. 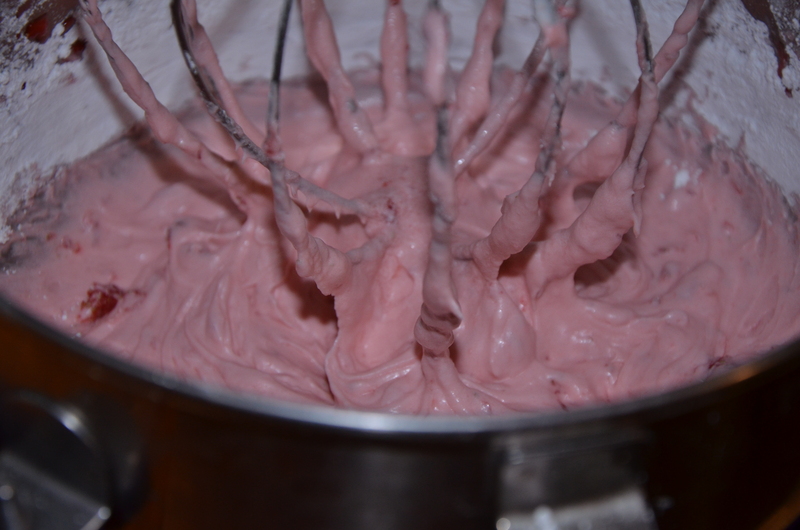 Add the strawberries to one container of buttercream. Blend and add additional powdered sugar if it is still watery. Pipe into (fill) the cooled cupcakes using the 1M Wilton tip. This tip is really not for filling cupcakes, but because of the strawberry chunks the 230 Wilton tip, used for filling, is not large enough. You may have to push the 1M tip into the cupcake, lift it up and remove cake from the tip, and then pipe. Finally pipe your buttercream rose following the rose tutorial. Next up, the Peanut Butter and “Jelly” (strawberry preserves) Cupcake with Peanut Butter Buttercream. Sorry for the not taking a picture of just the cupcakes. 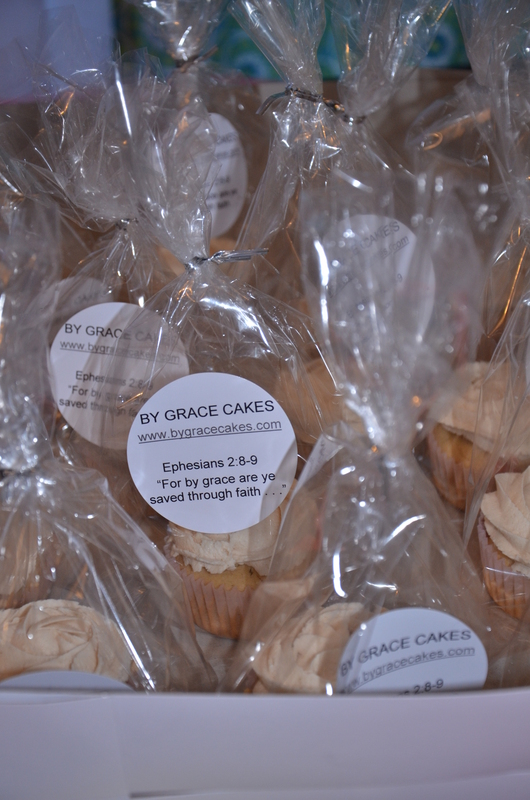 But here it is all packaged if your order some:). This recipe is adapted from my grandmother’s old Betty Crocker recipe book. Items that you will need: gluten free creamy peanut butter, your favorite jam or preserve, my buttercream recipe, cupcake liners, 1M Wilton tip, 2 1/4 cup gluten free flour (I would recommend Pamela’s), 1 1/2 cups sugar (Stevia), 3 tsp. baking powder, 1tsp. salt, 1/3 cup shortening, 1 cup almond milk, 2 eggs. Preheat your oven to 350 degrees. Mix flour, sugar, baking powder, salt and add shortening, almond milk, eggs, and 1/3 cup peanut butter. Pour into cupcake liners and bake. Once cooled fill with the preserve or jam of your choice using your 1M tip. 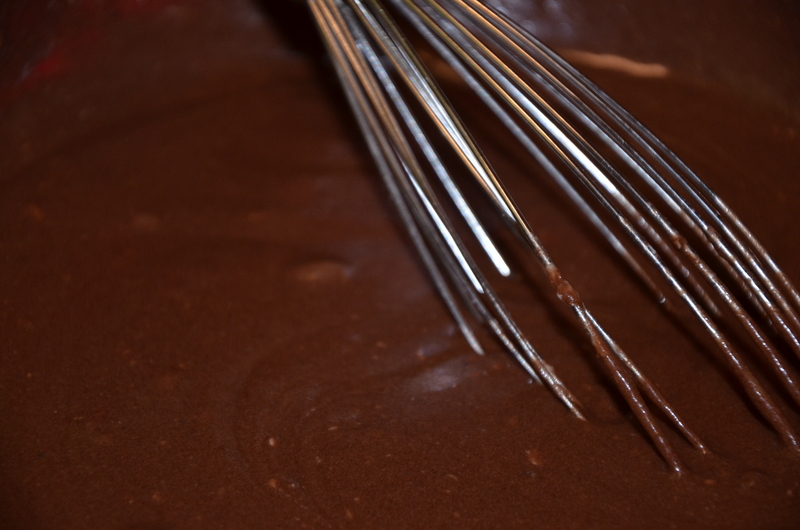 To make the peanut butter buttercream, that’s a mouthful, make my buttercream recipe and add 1/2 cup peanut butter. If it gets too sticky, add a little milk (1 Tbsp. at a time). If you would like it a little more peanut buttery, add 1/4 cup more peanut butter. Just experiment to your liking. Use the 1M tip to create the rose. Pipe from the middle and work your way outward. « That was fun! Let’s do it again! Hi Angela, I can not believe these were Gluten free they tasted like the regluar cup cakes, they were so good I even at ate Steven’s he left it here so 2 days later I asked him if he was going to eat it, No answer for 30 min so at 10:00pm with my hot chocolate Yep I ate it. Yummy Then I smacked my hand for eating so late at night. LOL.